Welcome to Post-weekend Poetry and the seventy-third poem in this series. This week’s piece is by memoirist Jill Schaefer. Now as for tennis, I so love the game. And without a net wouldn’t be the same. With a fast forehand or backhand shot. And best of three sets sees you through. Your words to me ring so very true. Than poetry written in free verse. Robert Frost said “Writing free verse is like playing tennis with the net down!” which inspired me to compose this poem. Jill has lived on the California West Coast for the past thirty-five years, fifteen years of which were in Santa Barbara and Goleta and twenty in Lompoc. She, her late husband and three sons emigrated from England and Germany in 1974. 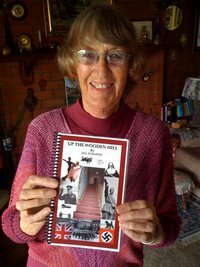 ‘Up The Wooden Hill’ is a historical memoir about the author growing up in London’s Blitz and her husband in Nazi Germany before, during and after World War II, featuring two tales seen through different spectacles. Stories of love and war, tears and laughter, families, friends and foes. From school days fraught with sibling rivalry and controversies with parents, lives are rebuilt, the Deutsche mark revalued and a father de-nazified. Both the young people mentioned in the book learn apprenticeships, experience calf love and the beginning of a postwar world. “Coming of Age in California -English Style-” is a lighthearted account of the author’s true story of herself, a naive English teen, fresh from home and convent school, venturing forth with a girlfriend to the California of the 1950s. The duo travel from Southampton, England on the Queen Mary to New York City, cross-country by Greyhound bus via Route 66 to a welcome in Pasadena. The two girls first visit California’s small town of Bakersfield, then on to Hollywood with an involvement in a call-girl ring. The journey continues to Long Beach and a job with the Miss Universe Pageant, and finally to San Francisco, city of sophistication and singles bars. Along the way they encounter climate, communication, customs, and cultural challenges…and a disintegrating friendship. 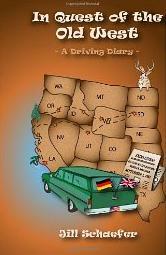 As a Cold War dilemma unfolds, an Anglo-German couple, Jill and Horst, drive off on a lighthearted jaunt through the western states of America, their adopted country. Jill keeps a daily journal of their fortnight’s trip through the Western States to the Dakotas and back to their home in California’s coastal city of Santa Barbara. News alerts of the US / Russia drama up-date the couple on their driving journey of discovery, as they dig and delve into the past, dally with locals, delight at historical sites, and day-dream into the future.